Indiaplaza Verdict: Hilarious, Entertaining, coming of age of the blog! 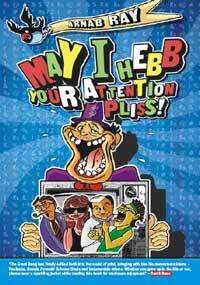 The Harvard intellectual’s words resonated in my mind as I picked up Arnab Ray a.k.a Great Bong’s “May I Hebb your Attention Pliss”, henceforth addressed as MIHYAP. “Are babies as insightful as a Harvard professor at the end of his career? “, I could not help but wonder as a recollection of some utterly hopeless situations of life, played out in chronological order. Most of us have experienced these situations and have lived to tell the tale. Situation 1: In their bid to entertain a newborn, grannies in the family circle showcase their expertise in acrobatically flexing their tongues with finesse that would put Russian gymnasts to shame, and produce goose-bumping sounds in an infinite loop. The baby responds with a brave chuckle even if only in the hope of stopping the sound loop albeit momentarily. Situation 2: After the passage of few months, the baby encounters people who suddenly remember the acute lack of exercise and sports in their lifestyle the moment the baby is passed on to their hands and indulge in catching practice by launching the baby towards the ceiling. These people practice with the toddler used as a ball as in throw ball, volleyball, sugreevaball etc. Rendered helpless but not to be defeated, the baby again prevails with an insuperable smile on its face! Skipping Situations 3 to 20 as you have got a hang of the situations by now! Buy the book @ 34% savings! Readers, who have never checked out Great Bong’s blog, “Random thoughts of a demented mind”, will find the writing fresh and hilarious. Especially, folks who grew up in the 80’s and 90’s will relate to the humour and chuckle with nostalgia. Chances are that they would not hesitate to call up friends at midnight to share lines from the book! As for regular readers of the blog, barring the occasional stretched chapter, the book will be a vintage Great Bong post eliciting fond reminiscences. There is plenty of new material thrown in as well. Arnab Ray has played his safe card by reproducing the success of his tried and tested blog format, in print form. Nonetheless, MIHYAP provides enough indications that the author is capable of traditional writing packed with razor sharp humour and even serious writing on the larger issues of our society. Verdict: A humorous account of our society and on “Being an Indian in the 80’s and 90’s”. Be informed that the book is filled with jokes that your mom/Wife won’t approve of! Better to read one chapter at a time akin to reading a blog post, as there is no common thread linking chapters. Note: Every review on Indiaplaza is written by a person who has read the book. Therefore, while every effort is made to give an unbiased and fair review, every review will have a personal element and opinion to it. Ultimately, every book experience is a personal one to the reader. I wanna say something,Cheap Soccer Jerseysespecially if I read a post that really grabs my attention. However, I won’t do it for the sake of doing it.didier drogba jerseysI just think that I really like in your article point of view.